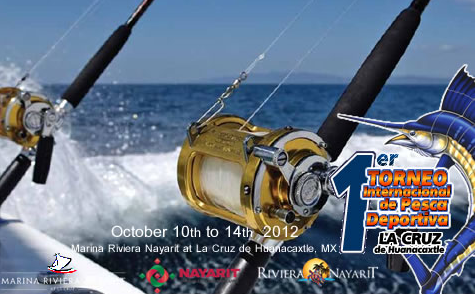 Are you participating in the First International Sport Fishing Tournament of La Cruz de Huanacaxtle from October 10 – 14, 2012? If so, Dreams Villamagna Nuevo Vallarta has an exclusive package for you! As a tournament participant, you will receive 10% savings on a Junior Suite Oceanview room as well as a complimentary box lunch for when you compete. Enjoy gorgeous views of Banderas Bay from your room, catch some prize marlin and tuna and savor the gourmet lunch that will keep you strong throughout the long day of competition! The rates associated with this package are subject to availability, so be sure to book your rooms now! Plus, this offer ends October 10th. This entry was posted in Dreams Villamagna and tagged Dreams Villamagna, Nuevo Vallarta, Riviera Nayarit, Sport Fishing Tournament. Bookmark the permalink.